Only rarely do I remember my dreams, but when I do, I’m struck by the power of the images and the feelings they evoke to open doors into other realities, into other ways of thinking about things. So when Mary Phelan contacted me about doing classes, I jumped at the chance to introduce dreamwork into the mix of topics offered on Global Spiritual Studies. Mary’s course, Mapping Your Dreams, contain a wealth of information about the nature of sleep, why we dream and how to tap into the amazing resource that is our sub-conscious. Mary is passionate about opening us all to the power of our dreams. ‘Let me start you on your journey – an insightful journey into yourself,’ she says. LINDA: When did you first get interested in working with your dreams? MARY: I have been interested in dreams and what they mean, as far back as I can remember. My dreams as a young child were vivid and many times consisted of images and stories from other lands and cultures. Because they appeared to have no connection to my waking reality, I was compelled to discover what they meant. I was like a dry sponge soaking up all the knowledge I could about dreaming and dream interpretation techniques. Even within my dreams, I was being taught about the meaning behind the symbols I was seeing. This assisted me greatly in developing the body of my work. It was during this time that I came to recognise how important it is to record your dreams. I have, for the most part, recorded my dreams consistently since I was seven or eight years old. I still find it great fun to go back and try out a new interpretation technique on some of those early dreams. Even all these years later, I am still discovering things about myself this way. LINDA: Why do we dream? MARY: There are many reasons why we dream and they all are so important. Dreaming helps to connect our conscious self with our unconscious self, which is crucial in maintaining a healthy mind and emotional body. Freud used to think that dreams were the only method of communication we had with our unconscious mind, and therefore the only way those unconscious drives had an outlet. But I feel one of the most important things is that dreams are the drawing board of creation. It gives us a place to try out new ideas, work out our feelings and to regain a state of peace and balance. MARY: Yes, everyone does dream, but not everyone is conscious of them. Even though science knows a great deal about the physiology of sleep, there is so much more it does not know. There are processes that occur during sleep and dreaming that we have yet to see the importance of. Dreaming is essential. As a matter fact, in some cases, not having an active dream life has been tied to certain types of depression. Simply put, we need our dreams. And once we retain our dreams, we are only part way there if we don’t uncover their significance. LINDA: Why do some people remember their dreams and others don’t? MARY: One of the many things that quantum physics is showing us, is that our dream realities are REAL, tangible locations in the fabric of reality. This means that in order to have our conscious mind remain aware of this multidimensional travel, we have to be in a higher state of consciousness. If we are shattered out of our sleep time by an alarm clock, we are immediately thrust into the vibration of the waking reality and it snaps us from the memories of our night’s adventures, just like snapping a twig. If we more gradually wake up, the experiences get converted into memory and then when we wake up, we are conscious of the memory of the dream. How we wake up and how we go to sleep can have a great bearing on remembering our dreams. But whether you remember them or not, they are still happening and in the advanced class, we actually go into techniques of interpreting dreams you don’t even remember! LINDA: If you tend not to remember your dreams, is there anything you can do to jog your memory? 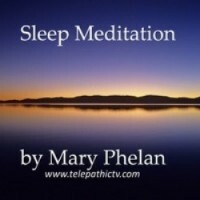 On the Telepathic TV website Mary offers a number of free guided meditations, one of which is designed to help you sleep. MARY: One of the best ways to remember your dreams is to make the decision to. I know it sounds simple, as if to say you’re not already wanting to remember them, but that intention, carried into the dreamtime, will go a long way. Write the statement on a piece of paper before you go to sleep. What this does, is carry this command into the dreamtime, just like you carry the dreams back into the waking reality. Some people find it effective to associate a smell with dreams. Essential oils can be used for this purpose. I’ve mixed a specific oil blend that I only use for this purpose. I smell it as I go to sleep with the intention of it being a trigger to remember my dreams, and then in the morning if I can’t remember my dreams, I smell the scent to trigger the memory. In the course, I give you some other techniques as well. LINDA: How useful are dream dictionaries? MARY: Most dream dictionaries are filled with symbolism based on someone else’s symbolic language. We can share much with other people, but ultimately your symbolism is unique to you. 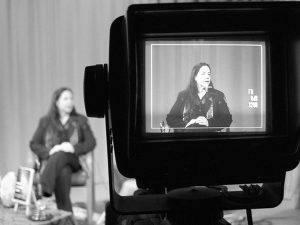 In Mapping Your Dreams, we go into the idea of bringing our own symbolic language into play during the interpretation process. This takes the interpretation from a general idea, down to very specific application. LINDA: What are the key steps in interpreting a dream? MARY: Over the many years I have been doing dream interpretation and teaching the subject, I have seen that many people get snagged on the same nails so to speak. Since many dreams don’t follow the formula of our waking reality, it can be difficult to orient yourself into the story. Dreams can be long with many twists and turns and learning to effectively interpret them, one must first understand their grammar. Once you break the dream down and understand its parts and components there is so much that can be seen. LINDA: What are the main benefits people get from doing the five classes in your course, Mapping Your Dreams? MARY: Dream interpretation is not just about analysing a dream based on a formula. It is also not just about the end result of understanding what that dream symbol may mean. To really get to the depths of all the richness dreams offer, you have to go all the way to the roots of the message by understanding the full dream experience. In this series, we explore the source of dreams, what they are, how to dream and how to recognise how you speak to yourself. As Freud said, dreams are the Royal Road to your unconscious, and there is no better way to understand yourself than to know how to interpret your dreams. These techniques help you to understand your inner language and you learn how you speak to yourself. This knowledge also helps you in your spiritual and psychic development. Your personal and unique inner language is yours alone and is used in all aspects of your inner world. These ‘dreaming keys’ help you unlock self-knowledge and lead to true personal power. Mary Phelan is the co-host of the popular and long running metaphysical television show, Telepathic TV, which airs in the Washington D.C. area and online at www.telepathictv.com). She is well known as an Intuitive Reader and Medium, Spiritual Empowerment Coach, EFT Practitioner and Trainer, Seichim Master Teacher and the author of the Inner Wisdom Cards, Spirit Animal Cards, Chakra Affirmation Cards and Mary’s Magical Message Cards. Mary is also an Ordained Minister and has designed intuitive arts program for online metaphysical universities. She holds regular workshops on Psychic Development, Dream Interpretation, Tarot, Emotional Freedom Techniques (EFT), Mayan Astrology and other spiritual and metaphysical subjects. Mary has been a student, researcher and teacher of the Intuitive Arts since she was a child and has been teaching and practicing professionally since the late 1990s. Having a background in computer science and esoteric research, she brings a grounded and innovative approach to her work. Her areas of discipline include her unique and ground-breaking techniques of dream interpretation, new ways to interpret and utilize tarot cards and her popular and in depth Psychic Development Series. She is a practicing Medium and Intuitive Reader and has taught thousands of people to develop these qualities within themselves. You can watch the first class in Mary’s course for FREE! It’s called Keys to Unlocking your Dreams. What do you think about the way Mary interprets dreams for a couple of people in the class? What’s your experience of dreaming? How do you integrate the messages that come through your dreams into your waking reality? We’d love to hear from you!